In food processor bowl, place all hummus ingredients except basil; process 1 to 2 minutes or until smooth. Add basil; pulse to mix. 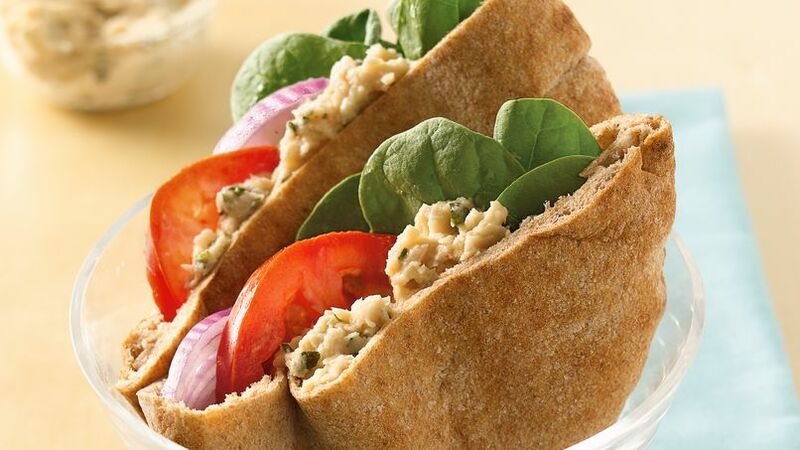 To assemble sandwiches, spoon about 2 tablespoons hummus into each pita bread half. Place spinach leaves, onion and tomato slices in each. Cannellini beans are loaded with fiber—the soluble kind that helps to lower blood cholesterol. Start slowly so you have time to get used to more fiber. Stuff pita bread halves with veggies and homemade hummus made with white beans and fresh basil.